Commonly called the Crosstown Expressway,1 Interstate 244 loops north to central Tulsa while Interstate 44 (Skelly Drive) bypasses to the southeast. The freeway connects with a number of radial routes leading outward from Tulsa, including the Sand Springs Expressway west, Tisdale Parkway north, Cherokee Expressway northeast and Broken Arrow Expressway southeast. Shared alignments bring U.S. 75 north from Jenks and U.S. 412 west from Catoosa in addition to U.S. 64 & Oklahoma 51 at Downtown. 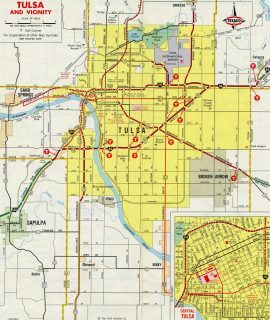 I-244 is the Red Fork Expressway from I-44 northeast to Downtown and the MLK Expressway from Downtown east to I-44.1 I-244 also represents the western and northern leg of the Inner Dispersal Loop (IDL) freeway system encircling Downtown Tulsa. Unsigned Interstate 444 comprises the south and east legs of the urban loop along side U.S. 64, U.S. 75 and Oklahoma 51. Construction rebuilt a five-mile section of Interstate 244 (MLK Expressway) starting with the section between Delaware Avenue and 73rd East Avenue on March 2, 2015. The $38 million project followed 2014 reconstruction of I-244 east from near Memorial Highway to I-44.9 It coincided with a $22 million contract (awarded February 2015) for the western portion of the construction zone, between U.S. 75 (Cherokee Expressway) and the IDL and Delaware Avenue. The freeway was resurfaced with concrete by October 2015 while work to replace overpasses at 73rd East, Delaware and Peoria Avenues and Admiral Place advanced to summer 2016.10. 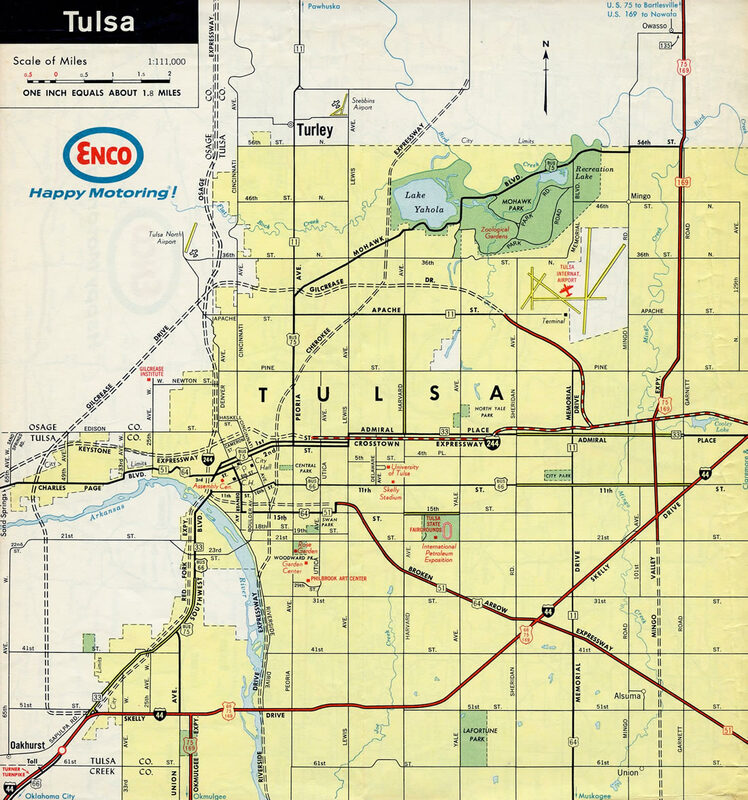 Interstate 244 replaced the entire loop of Oklahoma 33 through Tulsa. Interstate 244 under construction along the Crosstown Expressway from Utica Avenue east to Interstate 44. 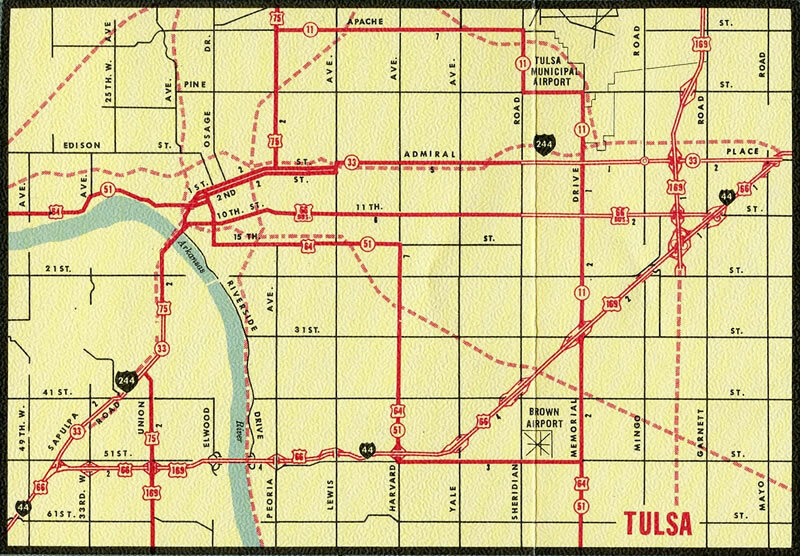 The Red Fork Expressway portion of I-244 and the Inner Dispersal Loop (IDL) remained unconstructed in 1968. The Sequoyah Loop was proposed as an outer loop around the north and west sides of Interstate 244. The Gilcrease Drive section opened east from Tisdale Parkway eventually as SH 11, while the portion of the route north from I-244 to the Sand Springs Expressway (U.S. 64 & SH 51) will be completed by the Oklahoma Turnpike Authority. A half diamond interchange (Exit 15) provides provides eastbound access from I-244 to 129th East Avenue ahead of the wye interchange with I-44 & SH 66. Photo taken 11/01/16. Interstate 244 & U.S. 412 veer southeast from 129th East Avenue to merge onto Interstate 44 & SH 66. No signs are posted for the transition. Photo taken 05/05/12. I-244 & U.S. 412 split from I-44 & SH 66 west to Tulsa International Airport (TUL) and the Osage Nation at a wye interchange (Exit 236B) in two and a half miles. Photo taken 11/02/16. A $31 million project started in January 2017 replaces the 145th Avenue East overpass across Interstate 44 and expands the freeway to six lanes from the 161st East Avenue on-ramp west to the split with U.S. 412 and Interstate 244. This scene changed by spring 2017 with all traffic shifted onto the eastbound roadway.12 Photo taken 11/02/16. Interstate 244 & U.S. 412 (Martin Luther King, Jr. Expressway) venture west nine miles directly to Downtown Tulsa. The two separate on the northwest side of the Inner Dispersal Loop (IDL) at U.S. 64 & SH 51 (Sand Springs Expressway). Photo taken 11/02/16. Former button copy signs posted on the approach to Exit 236B and Interstate 244 west on I-44 & SH 66 west. I-244 replaced the parallel route of SH 33 and U.S. 75 along Admiral Place to Lewis Avenue in Tulsa. Photo taken by Eric Stuve (12/01/02). Westbound I-44 at the split with MLK Expressway. 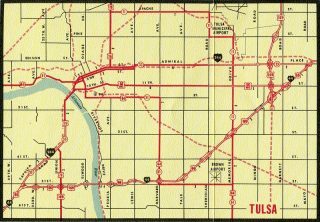 The control points for MLK Expressway include Sand Springs, a suburb of Tulsa along U.S. 64-412 & SH 51 (Sand Springs Expressway) west, and Enid, a city well to the west of Interstate 35 via the same U.S. route pairing. Including the lack of an exit tab, these signs were eventually carbon copied with Clearview font. The new panels were reused on a monotube sign bridge added here for Exit 236B after 2012. Photo taken by Eric Stuve (12/01/02). The eastbound lanes of I-244 & U.S. 412 cross over as a lane drop occurs for I-44 & SH 66 east. U.S. 412 merges onto Interstate 44 east for 4.3 miles to the point where I-44 turns north along the ending Creek Turnpike for the Will Rogers Turnpike to Joplin, Missouri. Photo taken by Eric Stuve (11/28/02). Interstate 244 and parallel Southwest Boulevard (old U.S. 66 Business, U.S. 75 Alternate and SH 33) come together south of Red Fork. Southwest Boulevard runs directly to the west of the ending Red Fork Expressway at Exit 1A. Photo taken 05/04/12. Entering the cloverstack interchange (Exit 1A) with Interstate 44 & SH 66 (Skelly Drive) east and the Gilcrease Expressway spur west on Interstate 244 west. The freeway spur to 51st Street was constructed as part of the overall outer loop planned with SH 11 on the north side of Tulsa. Photo taken 05/04/12. Exit 1A returns I-244 traffic to Tulsa via Interstate 44 & SH 66 east. The mainline otherwise defaults onto I-44 & SH 66 west ahead of their nearby split at the Turner Turnpike. Photo taken 05/04/12. Replaced guide sign posted south of the diamond interchange (Exit 1C) with 33rd West Avenue for the back to back ramps at 51st Street and Interstate 44. There is no direct connection to the Gilcrease Expressway spur from I-244 west. Instead the slip ramp to adjacent Southwest Boulevard provides the connection. Photo taken by Eric Stuve (12/01/02). Interstate 44 and SH 66 combine at the east end of the Turner Turnpike into a six lane freeway preceding Exit 223A with Interstate 244 east. Two lanes join the Red Fork Expressway northeast to the Inner Dispersal Loop (IDL) around Downtown while I-44 turns east onto Skelly Drive. Photo taken 05/04/12. Exit 223A departs from I-44 & SH 66 east for Downtown Tulsa. I-244 reaches the central business district in five miles. I-44 & SH 66 overlap across Tulsa to Catoosa (Exit 241) while Joplin lies 112 miles to the northeast. Photo taken 05/04/12. The cloverstack interchange between Interstates 44 and 244 ties into the Gilcrease Expressway spur west to 51st Street via Exit 1B. The spur travels at-grade from 51st Street north to 41st Street. 57th West Avenue extends north from there to West 21st Street near the Arkansas River. A $28 million Oklahoma Turnpikes project is proposed to connect these roads with U.S. 64 & 412 (Sand Springs Expressway) as a completed Gilcrease Expressway. Photo taken 05/04/12. Having left the Turner Turnpike just two miles back, I-44 advanced to within one half mile of the split with Interstate 244 at Exit 222B to 55th Place. The overhead for Exit 223A was replaced with a variable message board by 2007. Photo taken by Eric Stuve (12/01/02). Button copy guide signs posted ahead of the left-hand ramp (Exit 223A) for I-244 east on Interstate 44 & Oklahoma 66 east. Photo taken 05/28/95. Older signs for the Interstates 44 and 244 split referenced the Red Fork Expressway as the Martin Luther King, Jr. Expressway. The separation at Exit 223A is otherwise unchanged through 2016. Photo taken by Eric Stuve (12/01/02). Interstate 44 & SH 66 pass over 33rd West Avenue just ahead of the back to back ramps for Interstate 244 east (Exit 223A) and the Gilcrease Expressway spur west (Exit 223B). Photo taken 05/05/12. Exit 223A joins I-244 (Red Fork Expressway) leading northeast to Downtown Tulsa. The Gilcrease Expressway extends west from Skelly Drive to 51st Street and north to 41st Street. I-44 & SH 66 turn southwest and split at Exit 221B ahead of the tolled Turner Turnpike. Photo taken 05/05/12. “Tulsa World Stylebook – E.” Tulsa World (OK), April 15, 2015. “Phone Company Wires Crossed on 1-900 Billing.” Tulsa World (OK), July 18, 1990. “Groundbreaking ceremony launches I-244/Arkansas River bridge replacement project in Tulsa.” ODOT News, press release. April 15, 2011. “Westbound I-244 bridge coming down.” Tulsa World (OK), June 14, 2011. “New I-244 bridge awaits traffic tonight.” Tulsa World (OK), December 19, 2012. “Eastbound bridge up next.” Tulsa World (OK), March 5, 2013. “Next phase of I-244 river bridge to begin soon.” Tulsa World (OK), June 5, 2013. “I-244 bridge opens.” Tulsa World (OK), September 16, 2014. “Crews To Begin I-244 Rebuilding Project.” News On 6, March 2, 2015. Oklahoma Department of Transportation – I-244 project. “Starting Monday: 4 bridges over I-244 east of downtown to be replaced; work to last until next summer.” Tulsa World (OK), July 16, 2017. “From east to west, downtown and midtown, major projects affecting Tulsa traffic.” Tulsa World (OK), July 20, 2017.